he northern and southern parts of the valley are very different geographically. The Northern Rhône stretches south down the narrow valley of the River Rhône, from Vienne in the north to Valence in the south. The vineyards of Côte-Rôtie are on steep, precipitous terraces and provide some of the world’s most challenging viticultural conditions. The name Côte-Rôtie means ‘roasted slope’. This may be the most northerly of the Rhône appellations, but the vineyards have a superb aspect facing south-east and the soils are ideal for viticulture – high in minerals, relatively infertile and very well drained. There are only some 200 ha under vine, with a number of cru sections identified. The best quality wine comes from the centre of the appellation. Côte Brune to the north of Ampuis produces wines of fuller body, the Côte Blonde to the south lighter more elegant wines often with Viognier blended in, which is permitted here. The style of Côte-Rôtie is perhaps less overtly muscular than the wines of Hermitage and Cornas and its climate can be very marginal in achieving full ripeness. In great years, when everything comes together at vintage these wines at their best are quite sublime. Immediately south of Côte-Rôtie, the vineyards of Condrieu continue on the western bank of the river. They are planted on granite and sandstone rather than on the schistous soils to the north. The slope becomes less precipitous and the conditions are more suitable for that uniquely perfumed, aromatic variety Viognier. Widely planted now further afield, from the Languedoc to California, the variety has only come into vogue in the last decade or so. While the weight and aromatic power of the wines can be almost overwhelming, Viognier is a difficult variety to grow and Condrieu lacks the structure of other great French whites. The majority are best drunk in their first two or three years. An increasing number are now barrel-fermented on lees with bâtonnage and a few more are produced as late-harvest and very occasionally botrytis affected wines. The best of these can be stunning. The most extensive appellation in the north is Saint-Joseph. It encompasses the southern part of Condrieu and runs right down the western bank of the river to the borders of Cornas, just to the north of Valence. The reds are produced from Syrah, while the whites are a blend of Marsanne and Roussanne. The best wines are produced from the gravel-based soils close to the river. An impressive number of very good wines, both red and white, have been made in recent years and prices are rising. The best sites have real potential. 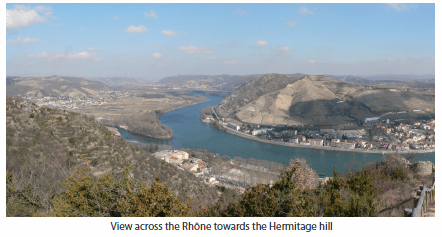 The great hill of Hermitage and its wines, dark, brooding and powerful, are perhaps the quintessential expression of classic northern Rhône reds. There are many fewer producers here than at Côte-Rôtie and a mere 131 ha of vineyards. The hill is split up into seven different crus or lieux-dits with varying soil types. One grower, Jean-Louis Chave, is able to draw on all seven in blending his reds. The Syrah is joined by whites based on Marsanne with some Roussanne. These can be remarkably long lived, often more so than the reds. New oak and destemming in the cellar are playing an increasing role and the whites often see barrel-fermentation. More often than not here though, the oak is used rather than new. Red Hermitage should be cellared, as it is slow developing. The white, too, needs years to show at its best. It can be approachable for a couple of years and then mysteriously close up, so if you plan to drink it young, do so within a year or two or else you will be very disappointed. Surrounding the hill of Hermitage are the vineyards of Crozes-Hermitage. The same grapes are used but the vineyard area is much larger and encompasses some 1,238 ha of vines. The better wines are made on isolated outcrops of granite and there can be a wide variation in quality. The best are very good and generally well-priced and there are an increasing number of relatively highly priced special cuvées. To the south and on the west bank of the river opposite Valence, are the appellations of Cornas, which borders southern Saint-Joseph, and immediately to its south Saint-Péray. Cornas is dense and muscular Syrah. It shares more in common with Hermitage than Côte-Rôtie, which is not surprising given its near proximity. A wide range of styles are produced, from the modern oak influenced wines of Jean-Luc Colombo to the fiercely traditional style of Auguste and Pierre-Marie Clape. At their finest, these are dark-fruited, intense and splendidly long-lived expressions of Syrah. Many of the Cornas growers also produce the still and sparkling wines of Saint-Péray; the still having greater potential on the whole. They are blended from Marsanne and Roussanne, like their white counterparts to the north. A further sparkling wine comes from a little further south-east under the Clairette de Die AC, which produces lighter semi-sweet sparkling Muscats. Crémant de Die is now the AC for dry sparklers from Clairette. At best they are crisp and fresh. There also some dry white still wines produced under the Châtillon-en-Diois appellation, from cool-planted Chardonnay and Aligoté in the same area.